Are you having a hard time getting pregnant? Need to make decisions about fertility treatment? We understand the trauma of infertility. Dr. Deborah Simmons and Debbie Fischer at partners (in)fertility specialize in all aspects of infertility counseling. We will hold hope for your dream of being a parent when you are not sure you still have hope yourself. We consult with the Center for Reproductive Medicine in Minneapolis. Through the American Society for Reproductive Medicine (ASRM) we consult with fertility clinics and egg donor and surrogacy agencies around the country. 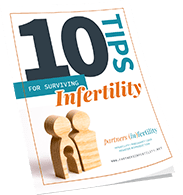 We keep up on the research on infertility treatment and can help you make decisions about how, when, where, and why to pursue fertility treatment. We are professional partners with Resolve: The National Infertility Association, Parents Via Egg Donation, and Fruitful Fertility.